“You and the Space Between” is one of three pieces in Ririe-Woodbury’s Accelerate. When Joan Woodbury and Shirley Ririe, two dance professors at the University of Utah, started the professional modern dance company Ririe-Woodbury in Salt Lake in 1964, they were taking a chance that people in Utah would watch and support contemporary modern dance in an age when the art form—led by choreographers like Trisha Brown and Alwin Nikolais—was pushing the boundaries of movement expression and challenging audiences to find their own meaning in sometimes very abstract performances. Though Woodbury and Ririe took their dancers into this contemporary realm, they also retained in their work a sense of joy, wonder and humor. In pieces like Affectionate Infirmities, choreographed in 1971, with dancers leaping, wiggling and spinning about on crutches, playfulness remained an engaging and central component of the company’s repertoire. Perhaps that entertaining sense of play is why, 50 years later, the Ririe-Woodbury Dance Company is still going strong. In celebration of RWDC’s important half-century anniversary, a milestone that few dance companies ever get to celebrate, Ririe-Woodbury took a chance on looking back at its roots, restaging works like Affectionate Infirmities and inviting back alumni dancers, both as performers and as guest choreographers. And as a complement to this retrospective look, the company’s final performance this anniversary season, Accelerate, will take an equally important look forward to the future path for the company and of modern dance. These days, modern choreographers play with all sorts of media and technology, from infrared sensors that trigger sounds to live-feed interactive videos. 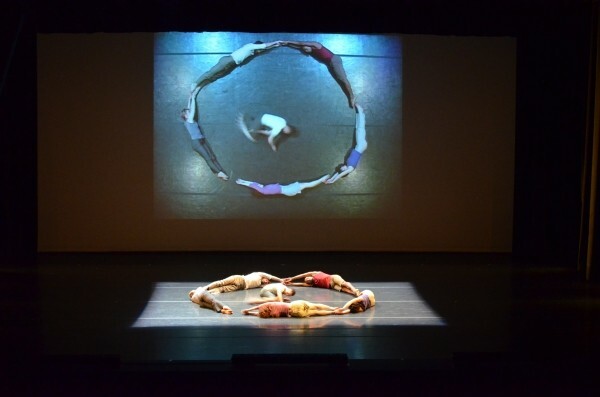 The video component of “States Rendered Choreography” formed slowly over the course of months through a tight collaborative process between Varone, who choreographed the movement, and Bromberg, who developed the media component. With Varone working in New York, setting the work to the dancers in his own company, and Bromberg working in Salt Lake City, the process has been long and complicated. Another guest choreographer debuting his work in Accelerate is Ririe-Woodbury alumnus Miguel Azcue. Born in Cuba and currently serving as artistic co-director for the Swedish dance company Memory Wax, Azcue’s varied experience gives his work an international style. Through added real-time video projection, “You and the Space Between” makes uses of technology in a way that is at once simple and clever, shifting the audience’s perspective in real time to play with gravity and space. Finally, Charon gets a chance to showcase his work with “Construct”, created in collaboration with composer and musician Michael Wall. Manipulating the time and scale of live video capture, “Construct” plays with the idea of image—what is real and what is virtual, and how important the difference is. Dance, on a certain level, has always been about watching beautiful performers at the peak of their physicality, pushing the limits of the human body. Still today, dance remains primarily an experience of the human body and of movement. Technology will never replace that. But, according to Charon, as Ririe-Woodbury moves towards the future, they expect to continue incorporating technology into their work as just another tool in the artist’s toolbox, expanding the vocabulary of contemporary dance.